Of all the British summer vegetables tomatoes are maybe one of the most versatile. So vibrant, plentiful and tasty. We grow them in the garden in pots, from grow bags and even in hanging baskets. Small cherry tomatoes do well in our garden but we have tried others too, with success. This year the yellow tomatoes have been so juicy and sweet, that think I’ve found my new favourite. 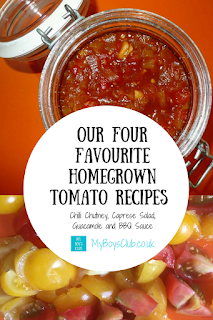 Here are four of our favourite recipes to make with homegrown tomatoes. We don’t have a greenhouse we just rely on the British summer with matching amounts of rain and sunshine to see the plants through – and even up here in the North East of England we haven’t been let down. They are so good just to eat fresh but when you have too many or you want a way of making your garden or allotment produce last longer - what do you do with it? My favourite recipe is chilli tomato chutney. I just love the taste. Spicy, fresh and flavoursome – makes any sandwich instantly better. 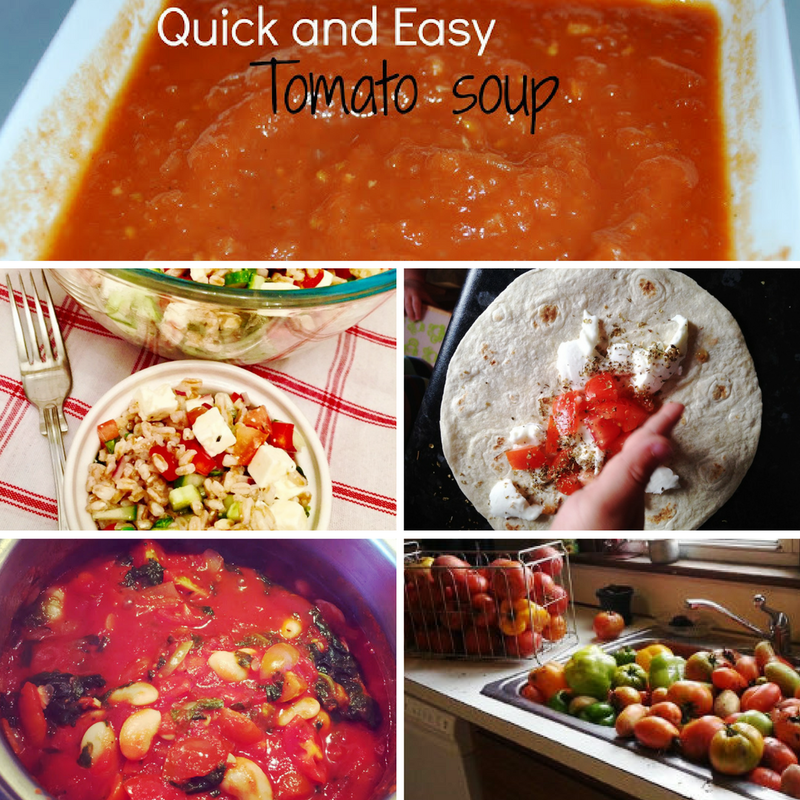 However, tomatoes are so versatile that you can make soup, salads, BBQ sauce, guacamole, pizza toppings and pasta sauce so easily. We have made all kinds of garden produce into chutney including peppers, plums and rhubarb, but tomatoes for me stands head and shoulders above all others. 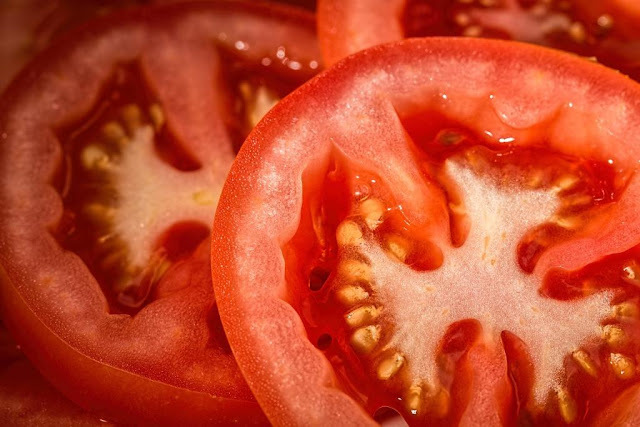 Whether red or green, tomatoes make an ideal base for these increasingly popular big-flavour condiments. Taking just an hour to cook one of the best things is that you can adapt the recipe to the amount of tomatoes you have, meaning a small batch can easily be made. Chutney is often thought of as a British treat, but it’s an Anglo-Indian fusion food that evolved from the thick, spicy fresh Indian sauces on every dinner table, that became more jam-like and a preserve with spice – resulting is a sweet yet sharp condiment that’s delicious with so many different foods. It’s the perfect accompaniment to cold cuts and cheese or straight on a cracker, crispbread, crusty loaf or even as a sauce for pasta. 500g onions – red or white – I used white on this occasion but also happily use red also. 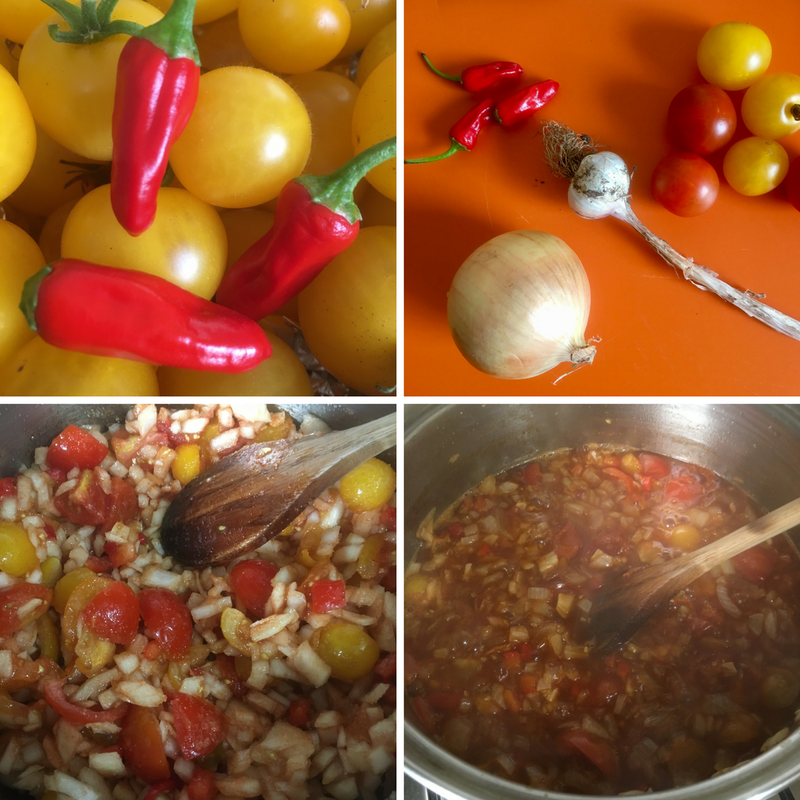 1kg fresh tomatoes – I used a mix of red and yellow cherry ones. 1 small garlic bulb – I used a small one out of the garden but if shop bought I’d go for half. 8 small fresh red chilli’s – again we grew ours but you can easily buy in a shop. Finely chop all the produce. Place all the ingredients in a large and heavy bottomed pan if you have one. Bring to the boil and then simmer for up to an hour. Stir occasionally during this time. Transfer into jars and refrigerate when cooled. We recently made homemade BBQ sauce and it was so easy. 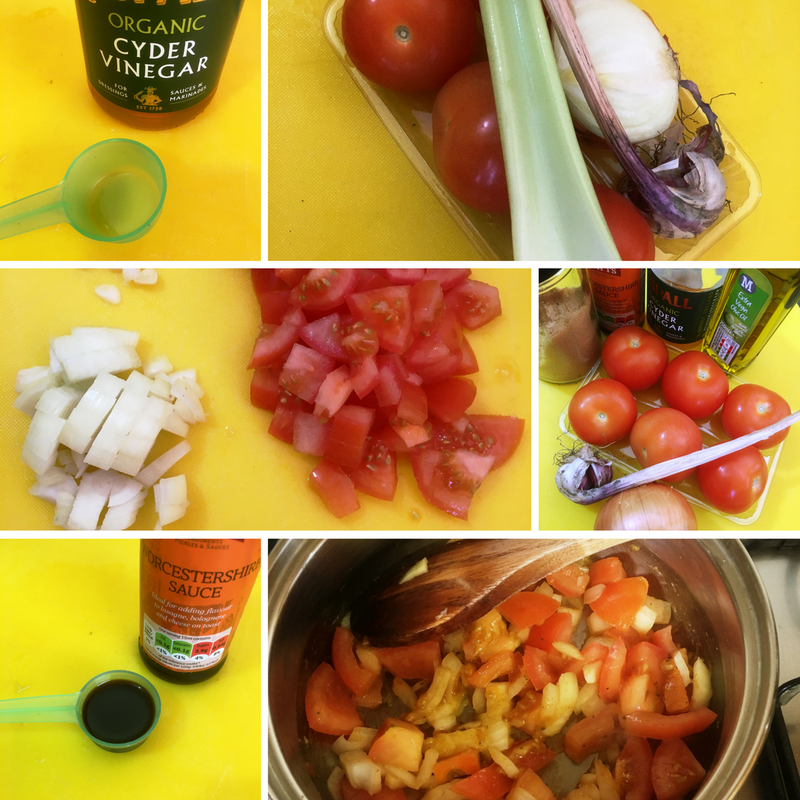 Take a handful of tomatoes, chop them, add onion, celery, garlic, brown sugar, vinegar and Worcester sauce and you can make your own BBQ sauce. Finely chop the onion and celery and soften in a pan with the oil over a gentle heat. Add the chopped tomatoes and garlic, continue to cook, stirring well for 5-10 mins or until the vegetables are soft. Add the Worcester sauce, vinegar and brown sugar and simmer on a low heat until soft and sticky in texture. Pour into a ramekin dish and wait until cooled to serve. This sauce will be slightly chunky in texture if you want it smooth blend before serving. A Caprese salad is found on the majority most Italian menus. You'll see it as 'Insalata Caprese' in Italian and means "Salad of Capri". In Italy, it is usually served as an antipasto - a starter dish rather than a side dish. 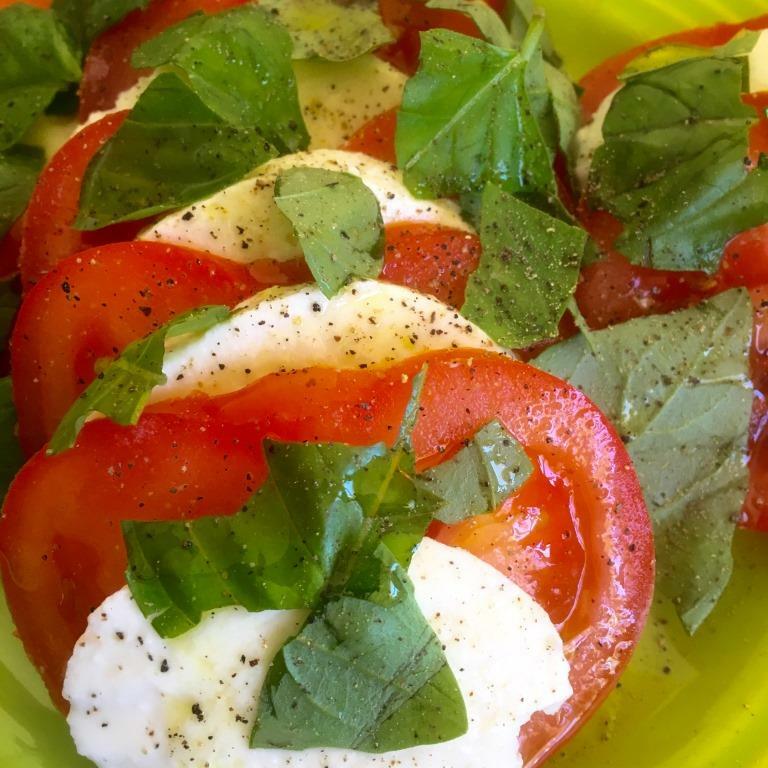 Make with Mozzarella, Fresh Basil and Tomato – full recipe here. Guacamole is an avocado-based dip or salad first created by the Aztecs in what is now Mexico. Eaten as a dip, condiment and salad ingredient it is so quick and easy to make. Finely chop the tomatoes, squash and add to the avocado. Chop he red chilli and add to the mix. Add a dash of lemon juice and mash together with a fork until smooth. Delicious as a sandwich filler, a topping on toast, just with nachos or part of a Mexican Family Feast! 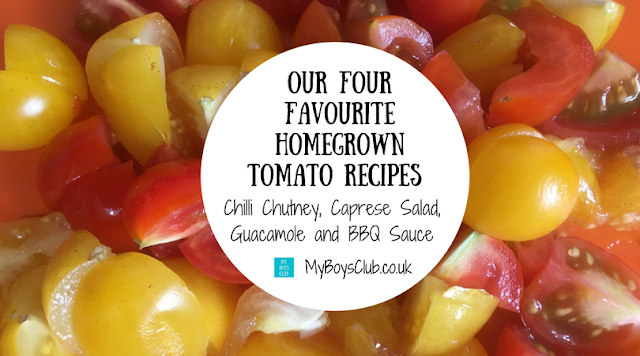 What is your favourite recipe for homegrown tomatoes? All of these sound amazing! I love growing our own veg. Home grown tomatoes, what a treat! I, living my whole life in the city, am used to "plastic" tomatoes from supermarkets. Here and there I tasted a home grown ones but they would never compare to the tomatoes I once tasted that were picked from the garden and put on the plate right away. I kid you not, I had tears in my eyes because they tasted soooo good and so different from those I knew (and did not really enjoy). Chilli Tomato Chutney sounds fab. I'm so going to try this one. Also love the guacamole recipe. 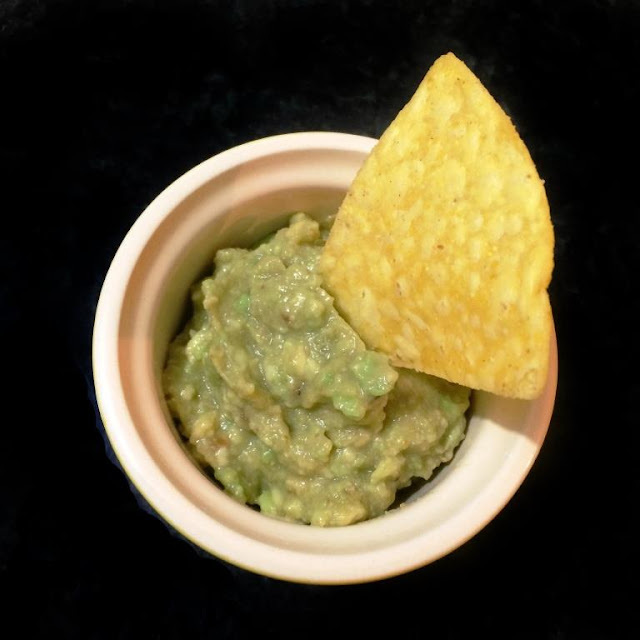 So delicious I love guacamole its one of my favourite dips ever although I have never actually made it myself. Your recipe sounds so simple though! We have plenty of red tomatoes here but I have not thought of growing yellow ones (perhaps next year). The BBQ sauce recipe sounds like one we'd like, I am currently thinking of what I can cook to go with it!